HandKrafted by Stephanie: MTME Sneak Peek Day 2 - Grab a Cup! 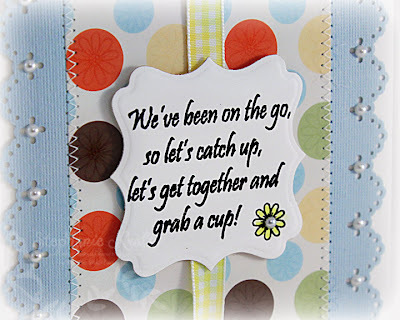 MTME Sneak Peek Day 2 - Grab a Cup! Hello! Today is the second day of sneak peeks for the My Time Made Easy © October release. This month is big - the biggest MTME release ever! Today I am showcasing the new Grab a Cup © template. Be sure to visit Lauren, Catherine, Katie and Pam to see more with Grab a Cup ©. Tammy and Debbie (our October guest designer) will be posting cards featuring some of the new stamp sets. And, please be sure to visit Ashley Cannon Newell, our special guest designer.. she has a fabulous project to show you! Here's a look at my complete gift set. I made a matching card to go along with Grab a Cup ©, which I filled with a bag of toasted pumpkin seeds. 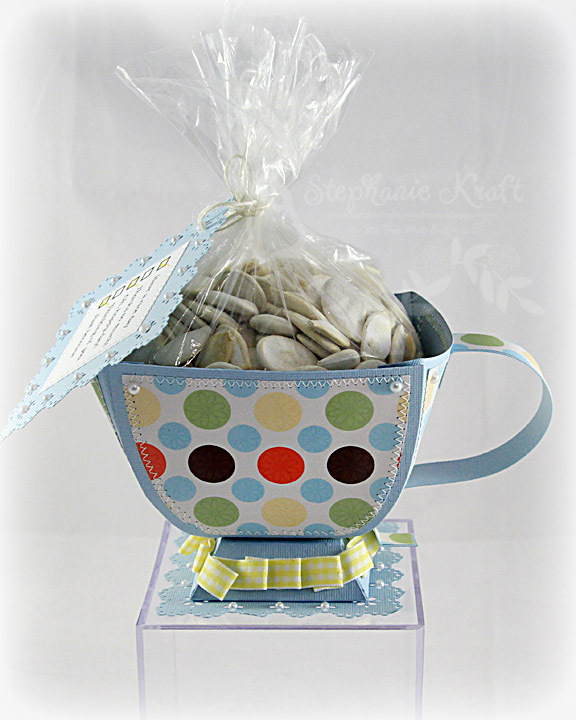 The polka dot digi patterned paper was created by Kristin and is part of the new Coffee Beans collection. 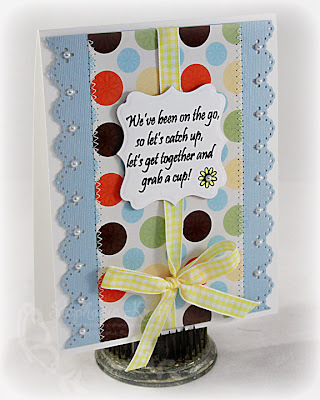 I used the Martha Stewart Eyelet Lace border and corner punch on my card, the tag and under the cup (to make it look like it is sitting on a doily). I also added tiny pearls along all the punched borders. Below is a closer look at the cup and tag. 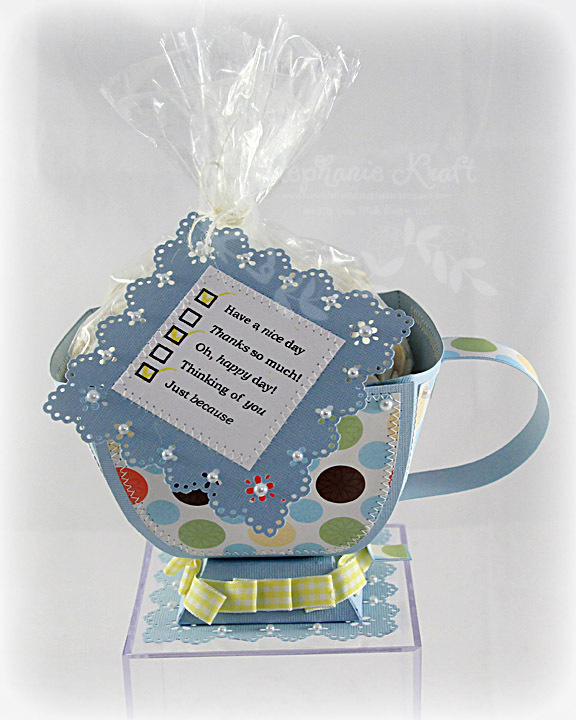 The sentiments, boxes and checkmark are all from the new stamp set, Fancy a Cuppa? ©. You can get a better look at the pearls in the shot below. I used 3 mm and 4 mm white flat back pearls from Pizzazz Aplenty. Below, I moved the tag to the side so that you can get a better view of the cup. I added stitching around all the decorative layers. 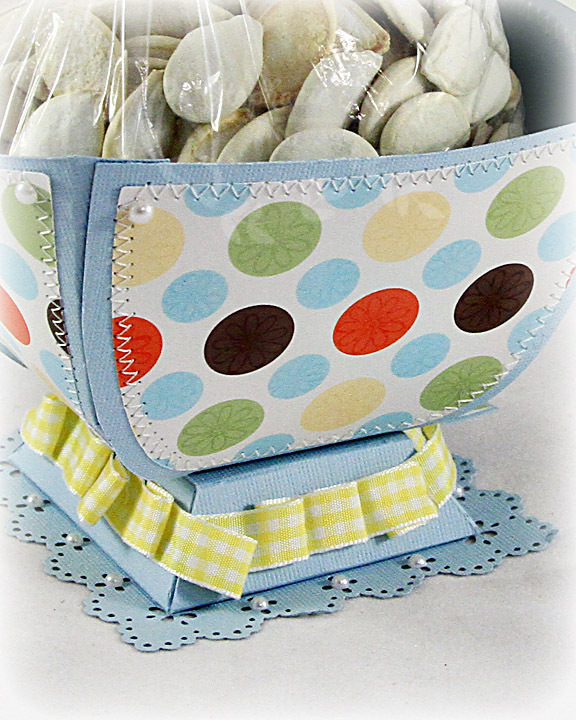 The cup sits atop a base, which I added some gingham ribbon around to look like pleats. Here's a close-up of the cup. I stamped tiny flowers inside each polka dot with Versamark Watermark ink. The flowers are also from Fancy a Cuppa? ©. Here's a look at the matching card. 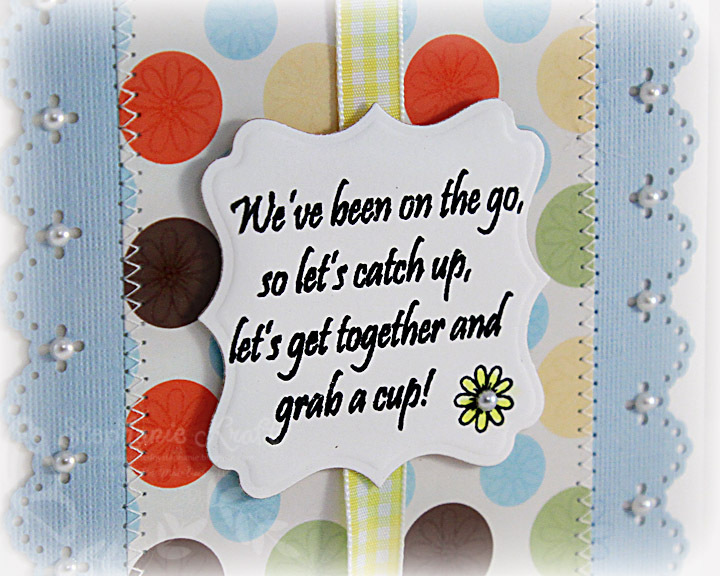 The sentiment is from Grab a Cup Sentiments © and the flower is the same flower that I stamped in the small polka dots. Thanks so much for stopping by! I'll be back tomorrow with the entire team for the official release! 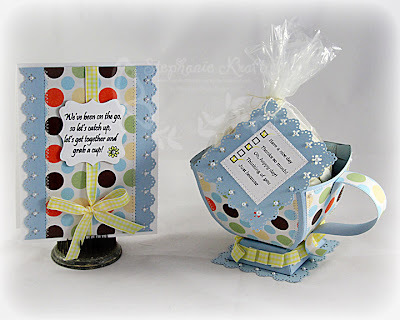 Accessories: Grab a Cup © template (MTME), Labels Sixteen Nestabilities (Spellbinders), Eyelet Lace border and corner punches (Martha Stewart), Markers (Copic), Pearls (Pizazz Aplenty), Gingham ribbon, Foam tape, Thread, Sewing machine. so fun! I love the bright and happy colors and the card layout is just fabulous! Oh goodness sakes - this is just fabby fab Steph. What a great idea for punkin seeds!! Love the pearls, the stitching - the layout on the card. Perfect!!! Another Wow! Love the design of the cup and the card is beautiful. I bet the family is always trying to get your fabulous gifts! Sweet! I love all the pearls and stitching, and that pleated ribbon on the bottom of the cup is fabulous!